A page from an illuminated manuscript. Words are important. Image from http://www.myarmoury.com/talk/viewtopic.php?t=28126&view=next. Hrothgar and his retinue depart the hall, and Beowulf prepares himself for the coming brawl. for the lord of the Danes, a steadfast guard against monsters. In this week’s passage of Beowulf the main focus is on the man himself. Such a combination of meanings in one word may seem strange but makes a sort of clear sense – to rule one must be the protector of his or her people, and what better way to represent that protection than a fence or a hedge growing round about them? The association with greenery that comes in with the related meaning “hedge” may also say something about the Anglo-Saxons’ Germanic roots, but what exactly I cannot say. There’s still much more for me to learn about this period. As per Beowulf himself, we see him her un-equipping all of his gear. He removes his equipment piece by piece and hands off his sword to his fellow Geats, who, at least literally, are nowhere to be seen. As a means of putting the spotlight squarely on Beowulf, the poet makes no mention of any of the other Geats here, instead only using an implied pronoun packed into the verb “het” (meaning “commanded,” but only in the third person singular) to refer to someone to whom Beowulf is handing off his sword. It’s weird that it’s in the singular rather than the plural, but I suppose Beowulf has a squire of sorts with him. Maybe it’s the later named (on line 2076) Handscio? Grammatical ticks aside, I don’t think it’s too weird that the poet would cut out the other Geats here. This is, after all, Beowulf’s time to shine. It’s just very odd that he travel with so many other men and not really use their skill at all. If Beowulf is so over-powered, then why bother with any other party members? Honestly, the only thing I can think of is to make a parallel between this story and that of Christ and his apostles. Such an analogy certainly wouldn’t have been lost on medieval (or Early medieval) audiences, and this sort of monstrous take on a demi-god come to redeem mankind from sin (Beowulf as Christ, Grendel as sin (being the kin of Cain, the first murderer)) could well be a major reason why our copy of Beowulf was found bundled with stories about monsters in the Nowell Codex. But moving on from the matter of the vanishing convenient Geats, Beowulf’s un-equipping himself seems to serve more purpose than just getting him to do some great deed. The word “truwode” is used in describing his mental state. This is a curious word to use in such a context because along with the somewhat visible Modern English meaning of “trust” the word also means “persuade.” I see two ways to take its having this mixture of meanings. One is somewhat positive: the Anglo Saxons regarded trust as something that needed to be earned, and that could be built up, but that was not, in any way, automatic. The other way to interpret it is less so: Anglo-Saxons were far more cynical than we might realize and their perception of trust is that it was nothing more than a pretense. A pretense with real results, but a pretense nonetheless. Since the reference to Beowulf’s trusting in his strength is paired with a mention of his faith in god’s protection (l.670), I feel like the first interpretation is probably more likely true. It’s curious, too, though. If Paul’s mention of spiritual armour (Ephesians 6:11) was only known to people writing poetry in English after a certain time, then maybe that could help date Beowulf. 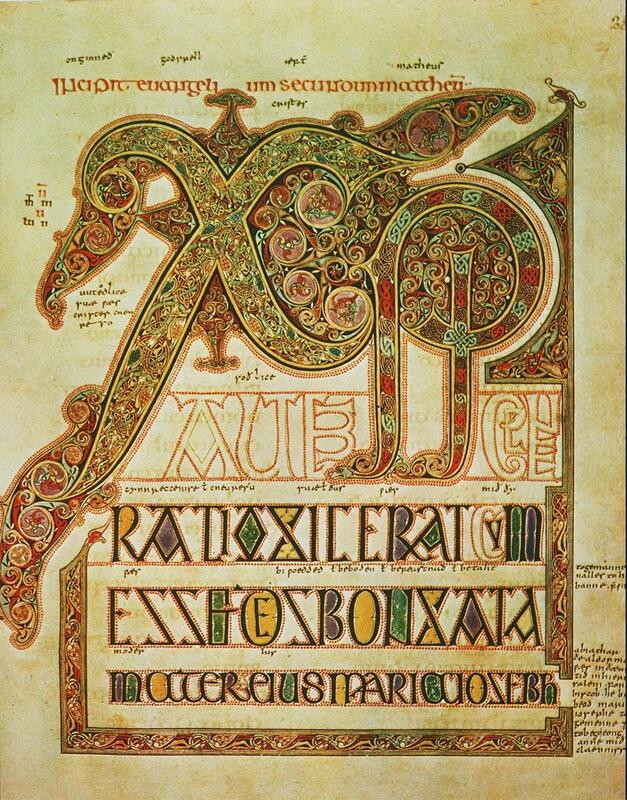 Or, maybe some preacher to the Anglo-Saxons (maybe even one from the Irish Celts) mentioned the concept of faith as armour in passing and it just stuck in someone’s head, bounced around, and found its way into their big ol’ poem. Finally, I just want to mention one weird thing about Beowulf’s sword. Actually, this ties back to the idea of a ruler being an enclosure for his or her people. On line 673, Beowulf’s sword is literally described as “best of iron servant” (“irena cyst ombihtþegne”). I think that this means it is served by the best of iron, that its concept as a sword is brought to greatest realization through its expression in its excellent iron. But why not just express this greatness of the sword with a reference to sharpness or the sword’s origin? What should it matter that Beowulf’s sword is served by the best of iron? What’re your thoughts on all of these points? Are the other Geats just forgotten by the poet because this poem is called Beowulf and not Beowulf and the Geats? Is Hrothgar an “enclosure” of his people as much as he’s their “prince”? Since this week’s passage has quite a bit going on in it, it’s also got its fair share of curious words. All of those that I’ve picked out for this section are compounds. Let’s see if I can get through them all in my fifteen minute writing time. So first up is wigfruma, a combination of the word for “war” or “strife” (“wig”) and the word for things like “beginning/creation/originator” and “prince/chief/ruler” (“fruma”). Since “fruma” carries senses of both being the first and being the topmost, I think this appellation fits Hrothgar rather snugly. No doubt Hrothgar started the odd war in his time and he’s described as having the fortunes of war favouring him (l.64). Actually, “wigfruma” suggests that the Danes are a put upon people, a people who have endured much strife and tribulation. In fact, I wonder just how common it was for a people to enter into a pact with another through a peaceweaver, a woman sent over as a sort of arranged marriage to secure peace. Was this something of a last resort or was it something that happened frequently enough to not really be talked about or mentioned in literature? Though, saying that Hrothgar is a war starter (one interpretation of “wigfruma”), I can’t help but wonder if he had started a strife with the Celts or Welsh, or wherever Wealhtheow hails from, and at the time that group perceived the Danes to be their greater, a people who could crush them, so they sent her to stop things from moving to total war. Next up is “cyningwuldor,” a word that combines the word for “king” (“cyning”) with the word for “glory/praise/heaven” (“wuldor”). There’s not much to say here. No matter how you interpret this word it’s meaning is pretty clear: god. Though it’s a strange way to think of a deity as the “king of praise” or the “king of thanks.” I mean, is that a title given because this particular deity is given the greatest amount of thanks and praise? Could this be referring necessarily to an early conception of the Christian god as taught by missionaries, or instead to the sort of all-god that Graves writes about in The White Goddess? The word “seleweard” is similarly simple. But, of course, it hides a certain twist when you dig down. The word combines “sele” (hall) with “weard” (“ward/advance post/waiting for/guardian/king;possessor”). Beowulf’s being a “hall ward” or “hall lord” or “hall protector” is clear enough: Hrothgar gave him possession of the hall for the night and he’s been keen on guarding it himself since he heard of the Danes’ plight. But, the other combination of “hall” and “lurking, or “waiting for” works just as well in this instance. Beowulf is indeed waiting in ambush for Grendel since the kin of Cain has no idea whatever that this mad Geat is there to meet him this night. Moving right along, the word “sundornytt” doesn’t seem to have much going for it. It refers to a special office or duty, but, weakly, could also mean “varied office.” Yeah, I don’t think there’s much here. The last compound word of note in this week’s passage is “eotonweard.” It brings together the word for “giant,” “monster,” “demon” (“eoton”) and “guard,” “ward,” etc. (“weard”). Now. In its original printing my Clark Hall and Meritt dictionary defined this word in the most tantalizing of ways: “watch against monsters? [sic]” It also lists this instance in Beowulf as the only appearance of the word in Old English. Unfortunately (fortunately?) in the supplement that’s part of my edition “eotonweard” makes another appearance. There it’s defined as “watch against the monster.” It’s a small difference (basically changing “monsters” to “monster,” made, perhaps, because there is just one Grendel, after all), but I still like to read this word as an echo of Hrothgar’s joking with Beowulf about not knocking the place down in the process of beating Grendel; I think it’s another hint at Beowulf’s own monstrousness. Actually, perhaps part of god’s help (whether it’s what Beowulf explicitly calls down or not) is helping him to keep his strength in check so that he doesn’t destroy the hall along with Grendel. Since this section is often about compound words, what do you think of my being so hung up on them? Are they just words that happen to be combinations of others, is there a fixed meaning to these combinations, or do you think that they’re a fluid mix of their parts? Next week we get Beowulf’s pre-bedtime speech explaining why he’s un-equipped himself. This entry was posted in Beowulf, poetry, translation, words and tagged Anglo-Saxon, Beowulf, Clark and Meritt, Grendel, Hrothgar, Old English, speculation, words by NSCZach. Bookmark the permalink.